GENEVA, Switzerland, May 12, 2016 (ENS) – Only cleaner transport, more efficient energy production and improved waste management can move the world’s poorest cities to reduce their air pollution – currently up to 10 times higher than levels approved by the World Health Organization, the world’s top health agency said in a new report released today. More than 80 percent of the people living in urban areas that monitor air pollution are exposed to air quality levels that exceed the World Health Organization (WHO) limits, the UN’s health agency said in a new report today. All regions of the world are affected, but populations in low-income cities suffer the worst effects. Some 98 percent of cities in low- and middle income countries with more than 100,000 inhabitants do not meet WHO air quality guidelines. In high-income countries, that percentage decreases to 56 percent. 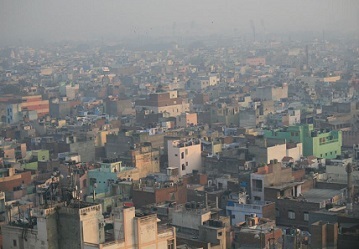 The WHO urban air quality database covers 3,000 human settlements in 103 countries ranging in size from a few 100 to more than nine million inhabitants. Most of the data comes from cities with populations of 50, 000 inhabitants or more. Roughly 25 percent of the data comes from smaller urban areas of up to 20,000 residents. In the past two years, the database has nearly doubled, with more cities measuring air pollution levels and recognizing the associated health impacts. “Air pollution is a major cause of disease and death. It is good news that more cities are stepping up to monitor air quality, so when they take actions to improve it they have a benchmark,” says Dr. Flavia Bustreo, WHO assistant-director general, Family, Women and Children’s Health. “When dirty air blankets our cities the most vulnerable urban populations – the youngest, oldest and poorest – are the most impacted,” she said. Ambient air pollution, made of high concentrations of small and fine particulate matter, is the greatest environmental risk to health, causing more than three million premature deaths worldwide every year. As urban air quality grows worse, the risk of stroke, heart disease, lung cancer, and chronic and acute respiratory diseases, including asthma, increases for the people who live in these cities. 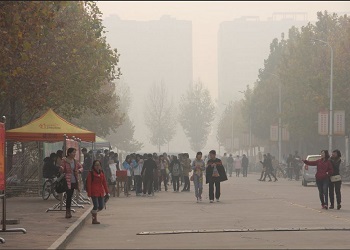 PM10 and PM2.5 include pollutants such as sulfate, nitrates and black carbon, which penetrate deep into the lungs and into the cardiovascular system, posing the greatest risks to human health. Most sources of urban outdoor air pollution are beyond the control of individuals and demand action by cities, as well as national and international policymakers to promote cleaner transport, more efficient energy production and waste management. But it is possible for cities to clear the air. More than half of the monitored cities in high-income countries and more than one-third in low- and middle-income countries reduced their air pollution levels by more than five percent in five years. During the World Health Assembly, May 24-30, Member States will discuss how to counter the adverse health effects of air pollution.